The new effort, led by Republican Senator Susan Collins of Maine, would aim to close a loophole in U.S. law that allows people on terrorism watch lists to buy weapons and explosives. A group of Republican senators on Friday were trying to craft compromise gun control legislation that could attract both Republicans and Democrats and have a hope of passing the US Senate, unlike several measures that are expected to be voted on next week for which prospects appear dim. Congress is under pressure to act after the massacre last Sunday of 49 people at a gay nightclub in Orlando, Florida, the worst mass shooting in modern US history. But the gun control issue is deeply divisive and there have been no restrictions passed since 1994, when Congress imposed a ban on semi-automatic assault weapons. That expired after 10 years. The new effort, led by Republican Senator Susan Collins of Maine, would aim to close a loophole in US law that allows people on terrorism watch lists to buy weapons and explosives. Both the gunman in the Orlando attack and the married couple who carried out a mass shooting that killed 14 people in San Bernardino, California, last December were thought to have been inspired by militant Islamist groups abroad. Collins’ proposal likely would be offered in the divided, Republican-controlled Senate sometime next week – assuming that four other gun-control proposals set for votes on Monday fail, as expected. Collins’ office declined to provide a detailed account of legislation she is working on with Senator Jeff Flake of Arizona and Kelly Ayotte of New Hampshire. 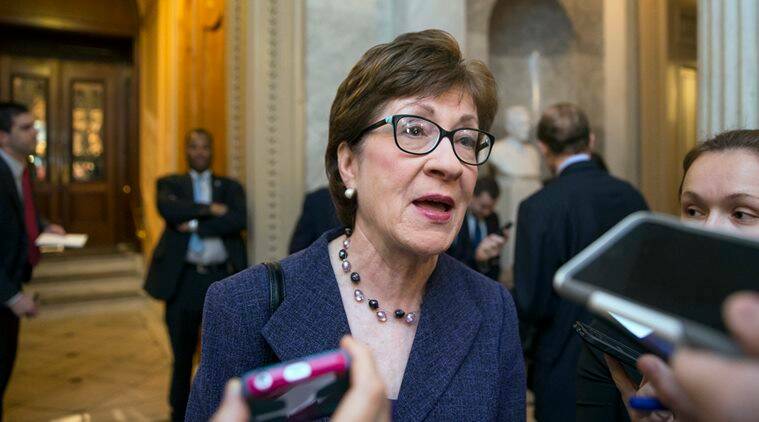 But Collins discussed the project with journalists outside the Senate on Thursday, noting that barring people on terrorism watch lists from weapons purchases carried with it the risk of affecting people who have been swept onto the lists without good cause. “What we’re trying to do is not deny constitutional rights to a large group of individuals who find themselves on watch lists despite the fact that there might not be credible evidence of potential criminal intentions, Collins said. At least one Senate Democrat, Heidi Heitkamp of North Dakota, has been involved in the talks, according to a spokeswoman. A Senate Republican aide who asked not to be identified, said the bill “will aim to have teeth on preventing terrorists from getting guns and contain protections for due process” for those who should not be denied their rights to buy weapons. It will not be known whether a Collins bill would attract wide bipartisan support until the measure is unveiled. On Monday evening, senators are scheduled to vote on two Republican and two Democratic amendments dealing with expanded background checks for gun buyers and denying sales to those on watch lists. Democrats have criticized the Republican measures as being ineffective and Republicans have accused Democrats of crafting bills that would trample constitutional rights to bear arms. The competing watch-list proposals were defeated in the Senate last December, following the shooting in San Bernardino. “Rather than doing Ground Hog Day, I think its time for a new approach and a more targeted one,” Collins said in an apparent reference to a 1993 film in which the main character is doomed to relive the same unpleasant day over and over again. Lawmakers are looking at whether to ban guns to prospective buyers who are on a broad terrorist watch list that is run by the FBI, but not on one of the subset lists such as the “no-fly” list, she said, adding that there could still be an “alert” to law enforcement officials that the purchase was being made. U.S. authorities maintain several watch lists – the FBI maintains three and the Office of the Director of National Intelligence runs one database. People are placed on such a list according to the threat level they are believed to pose. The Orlando shooter, Omar Mateen, had been on a government watch list at one point when he was being investigated by federal authorities in 2013 and 2014, but was not on it at the time of his weapons purchase. The couple who carried out the San Bernardino shooting were not on watch lists.